If you follow Megan Whitmer on Twitter (which you totally should) then you know she’s one of the funniest gals out there. So when she announced the release of her debut novel, BETWEEN, I just knew that I’d have to read it. And holy sheet, am I ever glad I did. 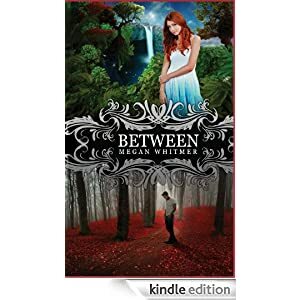 The story starts right away, which is always great, and soon, I was introduced to the Between—a place that’s between the mortal world and the magical realm. Megan was super freaking smart to make her MC, Charlie, an artist, because her artist’s perspective was perfect for describing both the Between, and Ellauria, the magical realm. The details filled my imagination, yet didn’t make me work for the imagery, which is the ultimate best kind of world building, in my opinion. Not because I’m lazy of course, but sometimes, too much description of a new world can stop the plot dead in its tracks. But that wasn’t the case in BETWEEN. Like, at all. In fact, the plot raced through each chapter, and oh what a plot it was! But I'm not going to tell you much about that because it's better you read it for yourself. You're welcome. Charlie’s internal narrative was ducking hilarious, and it had me laughing out loud more than once. If only I could be as witty. Seriously. Like you know when, in real life, you think of an awesome retort hours, days, or even weeks later? That’s basically how Charlie speaks and thinks ALL THE TIME. And the creative non-swearing was not only placed in the most perfect of places, but it added an extra element that’s uniquely Megan (as I read on her blog once that she purposefully didn’t want profanity in her book.). That small and consistent bit of voice really added to the overall vibe. So Megan gets some props for that. I’m slightly bummed that there was the still-creepy-and-will-always-be-creepy age difference between Charlie and Seth (her neighbour-turned-mentor), but thankfully, Charlie had some flirtatious moments with a boy who was more age-appropriate, and I enjoyed those awkwardly charged moments immensely. So if you’re a fan of YA fantasy, you’re absolutely going to want to pick up a copy of BETWEEN. There’s magic, killer dialogue, amazing one-liners, and enough chaos to keep you turning the pages, which is why I read it in one sitting even though I had a ton of other stuff to do. So go out and get it, people! Go out and get it now! Noted! It's on my wishlist now. Thanks for the recommendation!